Soybean is considered a healthy food. For one, it’s high in complete protein—meaning it provides all of the essential amino acids that you need for a nutritionally balanced diet. It’s also an inexpensive protein to buy, unlike animal meats, which can be quite pricey—especially if they’re organic! Soybeans also contain very high levels of a special nutrient called “phytic acid.” This nutrient is a mineral chelator, which means it can bind to certain minerals you ingest with your food, such as iron, magnesium, calcium, and zinc. This can help reduce the amount of minerals your body assimilates. Why would this be a good thing? Because mineral chelators, such as phytic acid, help prevent the over-mineralization of joints, blood vessels, and other parts of your body. Over-mineralization is a common problem for elderly people and leads to an acceleration of the aging process. 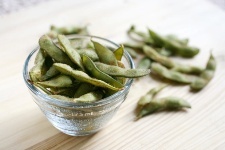 Now, in recent health news, Spanish researchers have found that soy contains another beneficial ingredient called “lunasin.” Lunasin is a peptide that contains 43 amino acids. Peptides are important for your good health because they have been shown to prevent cancer at all of its different stages. Lunasin also exerts anti-inflammatory and antioxidant properties that could contribute to its chemo-preventative effects. It sounds like soy protein isolate is your best option for getting a health-boosting dose of lunasin, phytic acid, and amino acids. Soy protein isolate is a dry powder that has been separated or isolated from the other parts of the soybean, making it 90% to 95% protein, and nearly carbohydrate- and fat-free. You’ll find it in a number of different foods, including soymilk, power bars, meat substitutes, cereals, and breads. For more on the health benefits of soybeans, read The Effects of This Food on Diabetes and Blood Pressure.